Broadcaster Press 3 March 20, 2018 www.broadcasteronline.com SCHOOL LUNCH MENUS Menus listed below are for March 21 – March 27. Menus are subject to change without notice. Vermillion Schools Breakfast Available everyday: Breakfast entrée or choice of cereals with toast. Fruit or Fruit Juice, Milk choices Wednesday – A. Waffles with Syrup, B. Cereal Choices and Toast, Mixed Fruit, Juice Choices Thursday – A. Breakfast Pizza, B. Cereal Choices and Toast, Pineapple, Juice Choices Friday – A. Fresh Baked Cinnamon Roll, B. Cereal Choices and Toast, Apple Sauce, Juice Choices Monday – A. Breakfast Pizza, B. Cereal Choices and Toast, Applesauce, Juice Choices Tuesday – A. Pancake Sausage Stick, B. Cereal Choices and Toast, Pineapple, Juice Choices Vermillion Elementary Schools Lunch Wednesday – A. Home-style Cheese Quesadilla & Beef Enchilada Soup, B. Crispy Chicken, Zesty Black Beans Thursday – A. Homestyle Cavatini, B. Mini Corn Dogs, Green Beans, Sugar Cookie Friday – A. Domino’s Pizza, B. Hot Ham & Cheese Sandwich, Golden Corn Monday – A. Homestyle Chicken Ranch Pasta and Dinner Roll, B. Cheeseburger, Green Beans Tuesday – A. Taco in a Bag, B. Hot Dog, Guacamole, Cinnamon Bread Stick Vermillion Middle School Lunch Wednesday – Cheese Quesadilla & Beef Enchilada Soup, Zesty Black Beans Thursday – Homestyle Cavatini, Green Beans, Sugar Cookie Friday – Domino’s Pizza, Golden Corn Monday – Homestyle Chicken Ranch Pasta and Dinner Roll, Green Beans Tuesday – Taco in a Bag, Guacamole, Cinnamon Bread Stick Vermillion High School Lunch Wednesday – Cheese Quesadilla & Beef Enchilada Soup, Zesty Black Beans Thursday – Epic Meltdown: Little Italy Grilled Cheese Sandwich, Green Beans, Sugar Cookie Friday – Hot Ham & Cheese Sandwich, Golden Corn Monday – Homestyle Chicken Ranch Pasta and Dinner Roll, Green Beans Tuesday – Taco in a Bag, Guacamole, Cinnamon Bread Stick St.Agnes School Lunch Wednesday – A. Home-style Cheese Quesadilla & Beef Enchilada Soup, B. Crispy Chicken Sandwich, Zesty Black Beans Thursday – A. Homestyle Cavatini, B. Mini Corn Dogs, Green Beans, Sugar Cookie Friday – A. Domino’s Pizza, B. Toasted Cheese Sandwich & Tomato Soup, Golden Corn Monday – A. Homestyle Chicken Ranch Pasta and Dinner Roll, B. Cheeseburger, Green Beans Tuesday – A. Taco in a Bag, B. Hot Dog, Guacamole, Cinnamon Bread Stick Elementary School Lunch Wednesday – A. Home-style Cheese Quesadilla & Beef Enchilada Soup, B. Chicken Nuggets, Zesty Black Beans Thursday – A. Homestyle Cavatini, B. Mini Corn Dogs, Green Beans, Sugar Cookie Friday – A. Toasted Cheese & Tomato Soup, B. Pizza, Golden Corn Monday – A. Bosco Sticks with Marinara, B. Grilled Chicken Sandwich, Baked Beans Tuesday – A. Baked Ham Slice and Dinner Roll, B. Chicken Nuggets and Dinner Roll, Scalloped Potatoes, Home-style Green Bean Casserole, Holiday Cookie Elk Point-Jefferson Breakfast Wednesday – A. Waffles with Syrup, B. Cereal Choices and Toast, Mixed Fruit, Juice Choices Thursday – A. Breakfast Pizza, B. Cereal Choices and Toast, Pineapple, Juice Choices Friday – A. Fresh Baked cinnamon Roll, B. Cereal Choices and Toast, Applesauce, Juice Choices Monday – A. Breakfast Pizza, B. Cereal Choices and Toast, Applesauce, Juice Choices Tuesday – A. 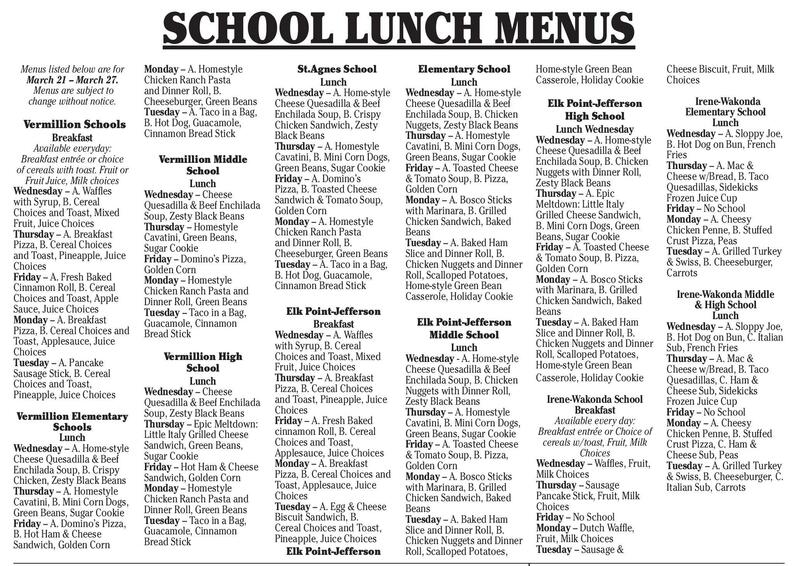 Egg & Cheese Biscuit Sandwich, B. Cereal Choices and Toast, Pineapple, Juice Choices Elk Point-Jefferson Elk Point-Jefferson Middle School Lunch Wednesday - A. Home-style Cheese Quesadilla & Beef Enchilada Soup, B. Chicken Nuggets with Dinner Roll, Zesty Black Beans Thursday – A. Homestyle Cavatini, B. Mini Corn Dogs, Green Beans, Sugar Cookie Friday – A. Toasted Cheese & Tomato Soup, B. Pizza, Golden Corn Monday – A. Bosco Sticks with Marinara, B. Grilled Chicken Sandwich, Baked Beans Tuesday – A. Baked Ham Slice and Dinner Roll, B. Chicken Nuggets and Dinner Roll, Scalloped Potatoes, Dakota Senior Meals Served at The Main Street Center & Town Square, “Meals on Wheels”. Please call before 9:00am to schedule or cancel a meal at 624-7868. Menus listed below are March 21 – March 27. Menus are subject to change without notice. All menus are served with whole grain bread and 1% milk unless otherwise noted. Wednesday – Chili w/Green Pepper, Crackers, Jell-O w/ Pears, Peaches Thursday – 3oz Turkey, 1/2c Baked Sweet Potato, 1/2c Creamed Peas, Orange Cookie Friday – 3oz Breaded Baked Fish, 1/2c Potato Wedges, 1/2c Parslied Carrots, 1/2c Acini di Pepe Monday – 3oz Roast Pork, 1/2c Mashed Potatoes & Gravy, 1/2c Harvard Beets, 1/2c Cooked Apples Tuesday – Cheeseburger Pie, 1/2c Green Beans, 1/2c Berry Fruit Salad, Banana Home-style Green Bean Casserole, Holiday Cookie Cheese Biscuit, Fruit, Milk Choices Elk Point-Jefferson High School Lunch Wednesday Wednesday – A. Home-style Cheese Quesadilla & Beef Enchilada Soup, B. Chicken Nuggets with Dinner Roll, Zesty Black Beans Thursday – A. Epic Meltdown: Little Italy Grilled Cheese Sandwich, B. Mini Corn Dogs, Green Beans, Sugar Cookie Friday – A. Toasted Cheese & Tomato Soup, B. Pizza, Golden Corn Monday – A. Bosco Sticks with Marinara, B. Grilled Chicken Sandwich, Baked Beans Tuesday – A. Baked Ham Slice and Dinner Roll, B. Chicken Nuggets and Dinner Roll, Scalloped Potatoes, Home-style Green Bean Casserole, Holiday Cookie Irene-Wakonda Elementary School Lunch Wednesday – A. Sloppy Joe, B. Hot Dog on Bun, French Fries Thursday – A. Mac & Cheese w/Bread, B. Taco Quesadillas, Sidekicks Frozen Juice Cup Friday – No School Monday – A. Cheesy Chicken Penne, B. Stuffed Crust Pizza, Peas Tuesday – A. Grilled Turkey & Swiss, B. Cheeseburger, Carrots Irene-Wakonda School Breakfast Available every day: Breakfast entrée or Choice of cereals w/toast, Fruit, Milk Choices Wednesday – Waffles, Fruit, Milk Choices Thursday – Sausage Pancake Stick, Fruit, Milk Choices Friday – No School Monday – Dutch Waffle, Fruit, Milk Choices Tuesday – Sausage & Irene-Wakonda Middle & High School Lunch Wednesday – A. Sloppy Joe, B. Hot Dog on Bun, C. Italian Sub, French Fries Thursday – A. Mac & Cheese w/Bread, B. Taco Quesadillas, C. Ham & Cheese Sub, Sidekicks Frozen Juice Cup Friday – No School Monday – A. Cheesy Chicken Penne, B. Stuffed Crust Pizza, C. Ham & Cheese Sub, Peas Tuesday – A. Grilled Turkey & Swiss, B. Cheeseburger, C. Italian Sub, Carrots Secretary of State Implements Legal Firewall PIERRE, S.D. 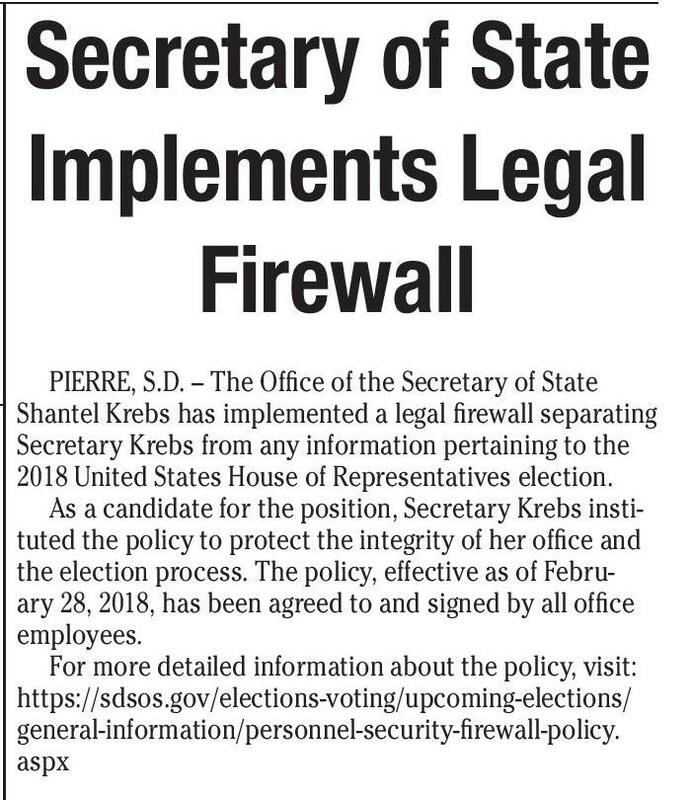 – The Office of the Secretary of State Shantel Krebs has implemented a legal firewall separating Secretary Krebs from any information pertaining to the 2018 United States House of Representatives election. As a candidate for the position, Secretary Krebs instituted the policy to protect the integrity of her office and the election process. The policy, effective as of February 28, 2018, has been agreed to and signed by all office employees. For more detailed information about the policy, visit: https://sdsos.gov/elections-voting/upcoming-elections/ general-information/personnel-security-firewall-policy. aspx person. A meal will be served at each session. Pre-registration is reCarpentry, Decks, quested by March 27th, 2018. Windows & Doors, Pre-registration is reRe?nishing, Drywall, & quested by March 27, 2018. Ceramic Tile Class space is limited to 20. To register, visit the iGrow events page. 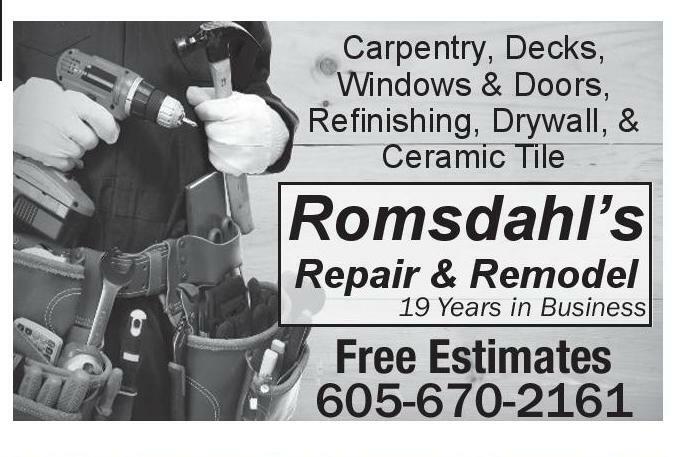 For more information, Repair & Remodel contact Taylor Gruss19 Years in Business ing, SDSU Extension Cow/ Calf Field Specialist at 605.995.7378 or by email for more information. Women Involved In Agriculture At Plankinton BROOKINGS, S.D. - If you're a woman involved in the agriculture industry, then Annie's Project may be the program for you. 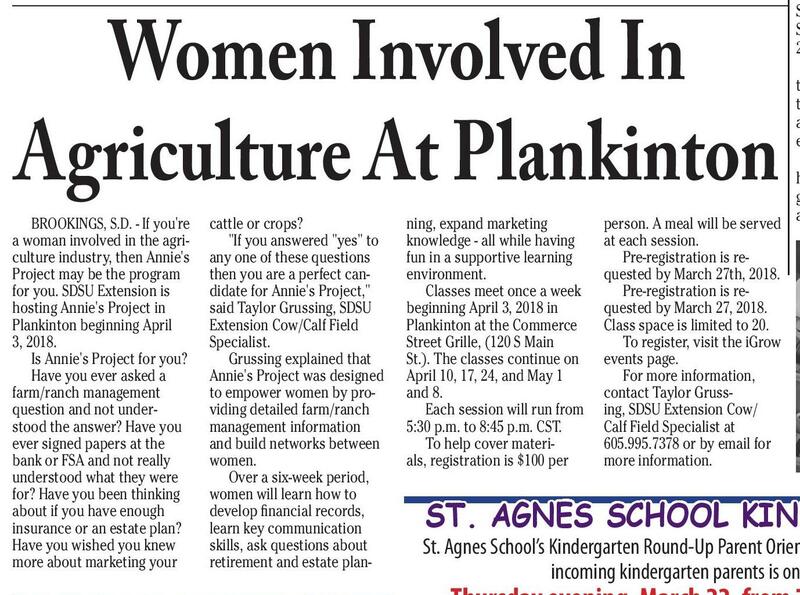 SDSU Extension is hosting Annie's Project in Plankinton beginning April 3, 2018. Is Annie's Project for you? Have you ever asked a farm/ranch management question and not understood the answer? Have you ever signed papers at the bank or FSA and not really understood what they were for? Have you been thinking about if you have enough insurance or an estate plan? Have you wished you knew more about marketing your cattle or crops? "If you answered "yes" to any one of these questions then you are a perfect candidate for Annie's Project," said Taylor Grussing, SDSU Extension Cow/Calf Field Specialist. Grussing explained that Annie's Project was designed to empower women by providing detailed farm/ranch management information and build networks between women. Over a six-week period, women will learn how to develop financial records, learn key communication skills, ask questions about retirement and estate plan- 4-H FRUIT SALE Extra boxes of fruit were ordered and are now available to be sold on a first-come basis. Produce available is Texas Red Grapefruit, California Navel Oranges, Washington Apples, Washington D’Anjou Pears, mixed boxes of fruit, beef sticks and cheese sticks. 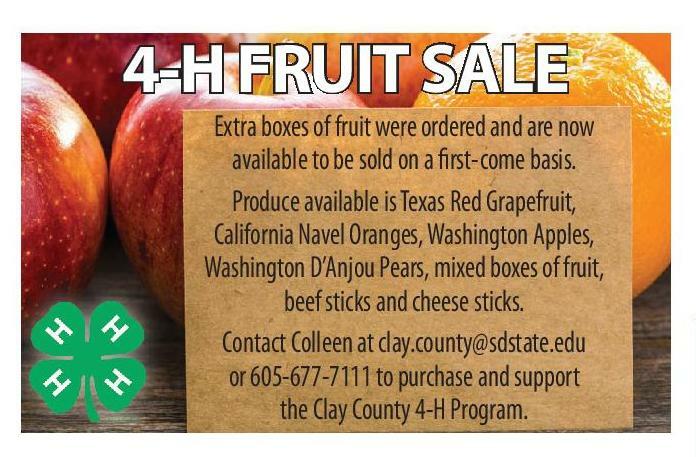 Contact Colleen at clay.county@sdstate.edu or 605-677-7111 to purchase and support the Clay County 4-H Program. St. Agnes Knights of Columbus Friday, March 23 Romsdahl’s Free Estimates 605-670-2161 ST. AGNES SCHOOL KINDERGARTEN ROUND-UP St. Agnes School’s Kindergarten Round-Up Parent Orientation Meeting for incoming kindergarten parents is on Thursday evening, March 22, from 7 to 8 p.m. in the St. Agnes School kindergarten classroom. 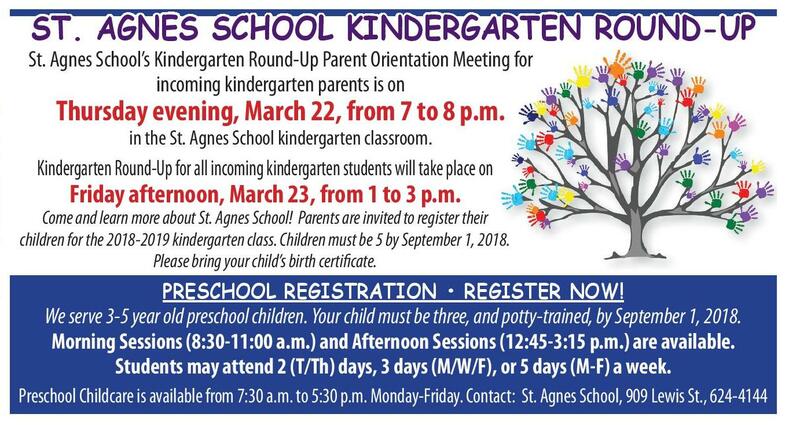 Kindergarten Round-Up for all incoming kindergarten students will take place on Friday afternoon, March 23, from 1 to 3 p.m. Come and learn more about St. Agnes School! Parents are invited to register their children for the 2018-2019 kindergarten class. Children must be 5 by September 1, 2018. Please bring your child’s birth certificate. PRESCHOOL REGISTRATION • REGISTER NOW! We serve 3-5 year old preschool children. Your child must be three, and potty-trained, by September 1, 2018. Morning Sessions (8:30-11:00 a.m.) and Afternoon Sessions (12:45-3:15 p.m.) are available. Students may attend 2 (T/Th) days, 3 days (M/W/F), or 5 days (M-F) a week. Preschool Childcare is available from 7:30 a.m. to 5:30 p.m. Monday-Friday. 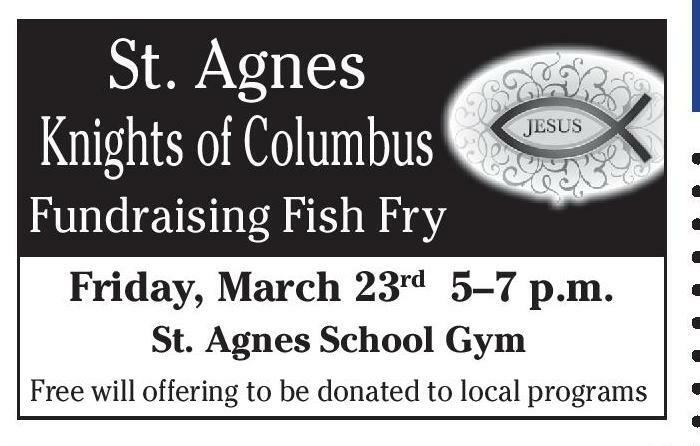 Contact: St. Agnes School, 909 Lewis St., 624-4144 Fundraising Fish Fry rd ning, expand marketing knowledge - all while having fun in a supportive learning environment. Classes meet once a week beginning April 3, 2018 in Plankinton at the Commerce Street Grille, (120 S Main St.). The classes continue on April 10, 17, 24, and May 1 and 8. Each session will run from 5:30 p.m. to 8:45 p.m. CST. To help cover materials, registration is $100 per 5–7 p.m. Annual St. Agnes School Gym Free will offering to be donated to local programs WEEKLY MEAT SPECIALS Baby Back Loin Ribs .............................. $269 Fresh Choice Top Sirloin lb. Or Flat Iron Steak ................. $399 lb. Fresh Pork Steak, Family Pak $ 49 $ 69 Chops or Boneless Loins.................... 1 lb. Fresh Choice Chuck Roast................ 2 lb. Fresh Choice Stew Meat Fresh Whole Choice Or Boneless Beef Ribs ..... $349 New York Strips............................................. $599 lb. lb. T-Bone Loins (cut free)........................ $499 lb. Grade A Boneless Chicken Breast ............................................. $169 lb. Jumbo Drumsticks................................ 79¢ lb. Thighs ................................................................... 99¢ lb. Breaded Chicken Nuggets ........ $199 2020 27th Street • Sioux City, IA lb. 712.258.5992 Fresh Pork Cutlets .................................... $199 lb. 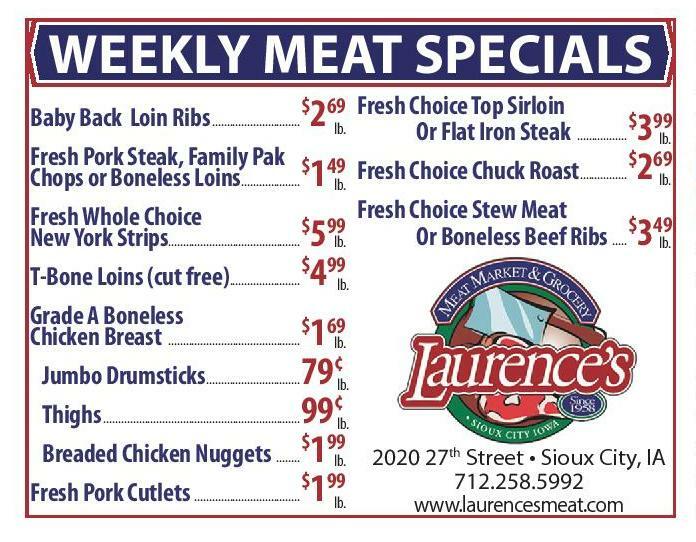 www.laurencesmeat.com All Members Welcome! 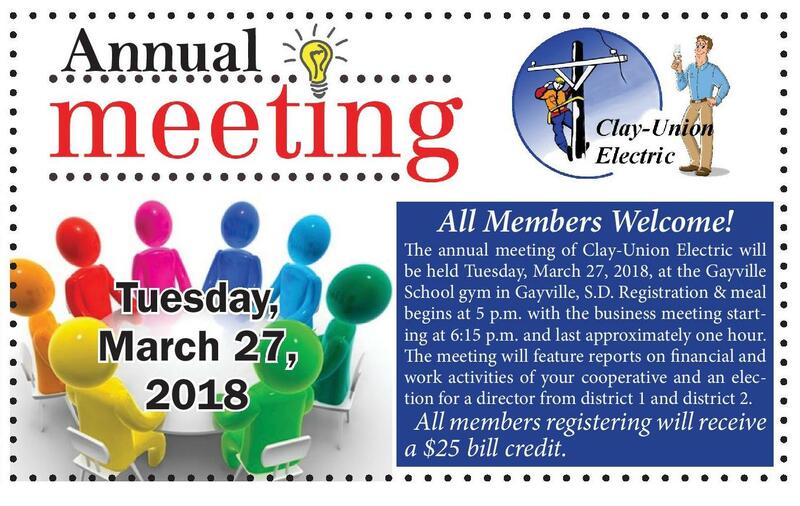 Tuesday, March 27, 2018 The annual meeting of Clay-Union Electric will be held Tuesday, March 27, 2018, at the Gayville School gym in Gayville, S.D. Registration & meal begins at 5 p.m. with the business meeting starting at 6:15 p.m. and last approximately one hour. The meeting will feature reports on financial and work activities of your cooperative and an election for a director from district 1 and district 2. All members registering will receive a $25 bill credit.